Kiltarlity Church is named after the Church of St. Talorgain or Talarican. Granted by John Bisset to his newly founded hospital of Rathven, the church of Kiltarlity was confirmed to the uses of the hospital in 1226. In the following year the church was recognised as lying within the diocese of Moray. The patronage thereafter remained annexed to Rathven, its revenues being utilised with those of the hospital and its other annexes to found a prebend of Aberdeen cathedral in 1445. The parish of Kiltarlity was much smaller than that of Convinth, and included the lands of Eskadale, Fanellan and Culburnie. The medieval kirk of Kiltarlity, the ruins of which still exist, lay on the south bank of the River Beauly, just below the Falls of Ess (now the site of a hydroelectric power station), and close by the medieval kirk of Kilmorack, which stood on a bluff on the north side of the river above the same falls. 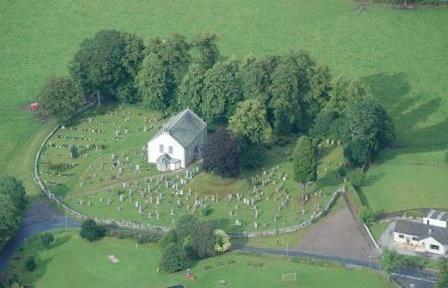 The present parish kirk of Kiltarlity & Convinth is at Tomnacross, formerly in Convinth parish. Kiltarlity and Convinth parishes were united c.1500 (Fasti 468), and the parish today is usually referred to simply as Kiltarlity. Kiltarlity and Kirkhill Churches were linked together in 1982. Kiltarlity linked with Kirkhill is in the Presbytery of Inverness. On the south side of the Beauly Firth the village of Kirkhill lies on the north side of the A863. Its neighbour Kiltarlity lies about four miles further on nearer Beauly on the south side of the A862 off the A833. Both parishes are areas of growth, both having primary schools, post offices and regular bus services. The nearest railway station is at Beauly and most children go to Secondary School or further education in Inverness.